It still amazes me that this day in age, that you need to remind people to backup their computers, or more commonly, try to convince people that backing up your important files once every six months to a flash drive or external hard drive isn’t exactly the best strategy. Now, you definitely have no excuse. Earlier this month Google released their new desktop client for Google Drive. The most important feature that it added that the client lacked before was the ability to automatically and continuously backup files on your desktop, documents folder, etc. Just download once, set it and forget it, the client does the rest. Best of all, every Gmail user already has 15 gb free! It’s not much but it’s plenty enough to backup impo documents and such. Even if you already have backups, why not just add one more layer on top of it for extra protection? Go download the Google Drive client for Mac or PC and get it setup and enjoy peace of mind. So I've used Amazon Cloud Drive as my primary online service provider for the last few years. How could I not? I mean, it was $60/year for unlimited storage. Over the past few years I've managed to store 4.6 terabytes of data on their cloud drive. Backups, movies, pictures, music, you name it and I probably had it stored in there. So you can imagine my disappointment when I logged into my account a couple of months ago and it said that my plan was changing from unlimited storage for $60/year to 5 terabytes for $299/year. And worse, I only had a month before my unlimited plan ended so I only had a month to find my data a new home. I lost faith in on premise external drives back in college when I dropped the external hard drive that contained my 200 gb of music and lost it all. I took about a week researching and researching different online storage providers. The biggest problem I had was all of the reputable companies that I knew that would be around years from now, all maxed out at 1 terabyte. 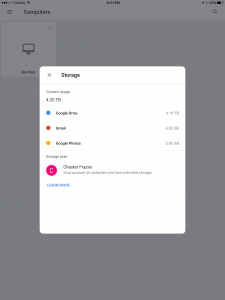 I finally gave up and decided just to upgrade my G-Suite Basic account ($5/user/month) to G-Suite Business ($10/user/month) so I could utilize the one terabyte storage in Google Drive and just move over the priority files. How G-Suite Business accounts are supposed to work is that for accounts that have less than 5 users, each user is supposed to be limited to 1 terabyte per user and for accounts that have more than 5 users, each user gets unlimited storage. I only have one user under my account (myself) so I was baffled when I went under my storage settings and it said that I had unlimited storage. So I decided to test it. I launched a Google Compute instance and started to transfer all of my data from Amazon Cloud Drive to Google Drive using Syncovory (so I could transfer 10 different files concurrently versus one at a time) and was able to transfer it all within a couple days. Two months later, still no issues. So if you are looking to store large amounts of data, give G-Suite Business a look.